Esophageal spindle cell carcinoma (ESpCC) is a malignant tumor composed of sarcomatous components. ESpCC is treated as a squamous cell carcinoma. However, because ESpCC is a rare tumor, little is known regarding its prognosis. This study aimed to analyze patients with ESpCC who were surgically treated at our hospital, determine the validity of surgery, and identify factors that indicate a prognosis. Treatment characteristics, overall survival (OS), and recurrence-free survival (RFS) of 28 patients with ESpCC who underwent surgery at our hospital between 1990 and 2016 were assessed. Furthermore, factors associated with OS and RFS were analyzed. 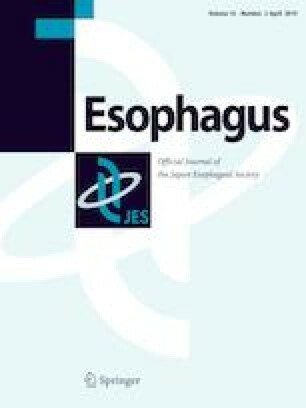 Subtotal esophagectomy with 3-field lymph node dissection and lower esophagectomy with 2-field lymph node dissection were performed in 25 and 3 patients, respectively. Chemotherapy was administered as preoperative therapy to two patients. Postoperative therapy, comprising radiotherapy and chemotherapy, was administered to three and nine patients, respectively. The 3- and 5-year RFS were 66.4% and 61.6% and the 3- and 5-year OS were 73% and 61.9%, respectively. Macroscopic type was identified as a prognostic factor. In terms of OS, prognosis was significantly worse in ulcerative-type ESpCC than in the polypoid type. The 5-year OS of ESpCC mainly treated with surgical therapy was 61.9%. However, prognosis was poor in some patients with ulcerative-type ESpCC according to macroscopic type. In the future, it will be necessary to accumulate more cases and investigate therapeutic strategies added to surgery to improve prognosis. All procedures followed were in accordance with the ethical standards of the responsible committee on human experimentation (institutional and national) and with the Helsinki Declaration of 1964 and later versions. This study was approved by an ethical review board in Keiyukai Sapporo Hospital. Informed consent or substitute for it was obtained from all patients for being included in the study.